DAY 8: Prize giving and the very best of Les Voiles de Saint-Tropez. Video published Oct 7, 2018. VST18 - DAY 7 - LA DER ! Les Voiles de Saint Tropez Officiel video above published Oct 6, 2018: Waves and nice breeze for the last racing day at Les Voiles de Saint-Tropez. Classics, moderns and Wallys made one more time the show, thanks to all the crews ! VST18 - DAY 6 - BAGARRE ! VST18 - DAY 5 - MAGIC !! Les Voiles de Saint Tropez Officiel video above published Oct 4, 2018: Challenge day at Les Voiles de de Saint-Tropez in 20 knots outside the bay of Saint-Tropez. Those brave to round the Nioulargue buoy delivered a splendid show while the kids made theirs inside the harbour. Fasten your seatbelts, it gets wet ! Les Voiles de Saint Tropez Officiel Day 3 video published Oct 2, 2018. Les Voiles de Saint Tropez Officiel video--50 knots of wind is too much to send everybody racing. Day 2 racing cancelled--but discover the brand new Lady First III and her crew ready to race! Les Voiles de Saint-Tropez 2018 Day 1 video. A look back: Les Voiles de Saint Tropez 2017 (video published Oct 8, 2017). RC44ClassAssociation video above published Sep 30, 2018: "From our editors at Icarus Sports all the best shots from the 2018 RC44 World Championship." RC44ClassAssociation video above published Sep 30, 2018: Team Nika became the first team ever to claim a hat trick of RC44 World Championship titles after Vladimir Prosikhin, tactician Dean Barker and their crew managed to fend off Igor Lah's Team CEEREF on the final day of big conditions racing off Cascais. The two boats started the day with Team Nika five points ahead. RC44 Class Association video above published Sep 29, 2018: Another adrenalin-pumping, top of the range day off Cascais at the RC44 World Championship saw Igor Lah's Team CEEREF claim two bullets from three races, enabling the Slovenian team to stay in contact with Vladimir Prosikhin's ultra-consistent leader Team Nika. RC44ClassAssociation video above published Sep 28, 2018: Day two of their 2018 World Championship will go down in RC44 history books with three races sailed in waves, and at the top of the wind range, forcing teams to break out their no3 headsails and small spinnakers. Racing got underway on time at 1300 when the wind was already in the mid-teens. Once again the right side of the race course, close to the shore, was paying massively, offering the triple win on the upwinds of tidal relief, flatter water and a favourable right shift. RC44 Class Association video above published Sep 27, 2018: Winning two out of today’s three races made Vladimir Liubomirov and Kirill Frolov’s Bronenosec Sailing Team the stand-out performer on day one of the RC44 World Championship. With winds starting at 12 knots and building into the high teens, plus flat water and shorts and T-shirt temperatures, Cascais laid on tourist board-approved conditions. However these only materialized mid-afternoon, after wise instructions to wait ashore by PRO Peter Reggio and the race management team from the Real Club Nautico de Cascais. The World Championship, Cascais, is the fourth event of the 2018 RC44 Championship Tour which pits the world's top businessmen and the best sailors in the industry compete in high-performance one-design 44-foot carbon racing yachts. 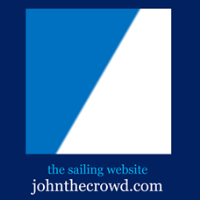 This edition of the World Sailing Show was published Sep 3, 2018. The Hempel Sailing World Championships was always going to be a big deal, but it wasn’t just the silverware and the sailors that drew the crowds in Aarhus, Denmark. With two years to go until the 2020 Tokyo Olympics, this was the first opportunity for nations to qualify for the Games and a key opportunity to start putting theory into practice for teams. Make no mistake, Aarhus was a big deal for all. Also: to Portugal for the TP52 World Championships and an exclusive guided tour of the world’s most advanced keelboats, as well as checking in with the Extreme Sailing Series in Cardiff. What went down on the final day of an incredible season. 52 Super Series video above published Sep 23, 2018. 52SuperSeries LIVE video Saturday, Sep 22, 2018. 52SuperSeries video above: Friday, Sep 21, 2018, the day that Quantum Racing won the 2018 52 SUPER SERIES. 52SuperSeries video Sep 20, 2018: Day 3 Highlights, 52 SUPER SERIES Valencia Sailing Week. 52 Super Series racing scheduled for Sep 19, 2018, Day 2, cancelled due to lack of wind. 52SuperSeries video above published Sep 19, 2018: Valencia, home of the 32nd and 33rd America's Cup. 52 SUPER SERIES Valencia Sailing Week, 18-22 September 2018. See also Final Day Highlights: Puerto Portals 52 SUPER SERIES Sailing Week 2018 (video). For more of the last regatta, see Puerto Portals 52 SUPER SERIES Sailing Week 2018, LIVE Aug 21-25. Also catch the Thrilling Photo Finish in Cascais (video), out of nowhere, Platoon Sailing Team comes FLYING in for the photo finish with Alegre TP52! 52 SUPER SERIES Valencia Sailing Week official website: 52superseries.com. Rolex World of Yachting video above published Sep 16, 2018: An intense, compelling 2018 Rolex Swan Cup witnessed competition go down to the wire across all six classes. German yacht OneGroup was crowned winner of the inaugural ClubSwan 50 World Championship following a momentous final day with Porron IX retaining the Swan 45 world title. Italian yacht Mela is the new ClubSwan 42 European champion while Six Jaguar (Sparkman & Stephens), Plis-Play (Swan Maxi) and Solte (Grand Prix) became class champions. The Rolex Swan Cup, defined by its close partnership between Rolex, Nautor’s Swan and the Yacht Club Costa Smeralda, magnificently portrayed the event’s diverse characteristics from innovation to tradition and from close competition to fair-play. Rolex World of Yachting video above published Sep 14, 2018: Three days of racing across six classes have concluded at the 2018 Rolex Swan Cup hosted by the Yacht Club Costa Smeralda in Porto Cervo, Sardinia. In the one design championships action is set to go down to the wire with Onegroup (ClubSwan 50 World Championship), Porron IX (Swan 45 World Championship) and Mela (ClubSwan 42 European Championship) currently assuming leadership. One of the compelling stories at the 20th edition of the event is the record presence of ten Swan 65s. Owned and skippered by passionate individuals, these yachts created ground-breaking feats in their heyday of the 1970s and today remain beautiful boats to race and cruise, admired by the sailing community. Rolex World of Yachting video above published Sep 11, 2018: The 2018 Rolex Swan Cup is underway in Porto Cervo, Sardinia, with an impressive and diverse 110-strong fleet from 17 different countries. The 20th edition of the event welcomes a wide range of Nautor’s Swan designs spanning 50-years of the marque’s history. Among the highlights of the week’s competition is the inaugural running of the ClubSwan 50 World Championship. Comprising twelve highly-competitive one design yachts the five days of racing are set to showcase close-fought, dramatic action. Leading the competition after the first day was German yacht Onegroup. The rocky outcrops and challenging waters of Sardinia’s Costa Smeralda will herald equally compelling action across all classes comprising the Sparkman & Stephens classic division as well as the ClubSwan 42 European Championship and Swan 45 World Championship. Great competition in an enviable environment, a prevailing spirit of fair play and an opportunity to sail yachts renowned for their grace, enduring appeal and rich heritage, the Rolex Swan Cup is one of the seminal events in the sport of yachting. The event is also defined by the historic, three-way partnership between Nautor’s Swan, the Yacht Club Costa Smeralda (YCCS), and Rolex, whose association with sailing marks 60 years in 2018. The 20th edition of the event will be held in Porto Cervo, Sardinia from 9-16 September and is set to welcome an international fleet in excess of 115 yachts with models ranging from classic Sparkman & Stephens designs dating back to the mid-1960s, highly-competitive one design classes, and cutting-edge Swan Maxis and Super Maxis. Live coverage from Sailing's 2018 World Cup Series in Enoshima, Japan on Sunday 16th September. Schedule of races (local time): 12:07 - Laser; 12:55 - Laser Radial; 13:42 - Finn; 14:30 - 470 Men; 15:17 - 470 Women. World Sailing TV Playlist of all videos from #wcsenoshima here. Rolex World of Yachting video above published Sep 8, 2018: The 2018 Maxi Yacht Rolex Cup ended in traditional fashion with the final prize giving on the Piazza Azzurra in front of the Yacht Costa Smeralda. The winners in each class were rewarded with the respect of their peers, the Maxi Yacht Rolex Cup trophies and, of course, Rolex timepieces, the recognized emblem of achievement. The week of racing on the waters of the Costa Smeralda and the Maddalena Archipelago, provided excellent competition for the 41 competing yachts. The victors were defined by the perfection of their execution both in preparation and during racing. 2019 marks the 30th edition of the Maxi Yacht Rolex Cup, which was founded by the Yacht Club Costa Smeralda in 1980, is hosted in cooperation with the International Maxi Association and has been supported by Rolex since 1985. “This coastline may present a tranquil scene, but this is a battle for honours,” says Commodore Riccardo Bonadeo of the Maxi Yacht Rolex Cup. Every September the Yacht Club Costa Smeralda welcomes the most advanced craft to the stunning Porto Cervo in Sardinia, for a week-long event like no other on the sporting calendar. Attracting a peerless line-up of sailing power, the Maxi Yacht Rolex Cup is also an essential rendezvous for innovators of cutting-edge yachting technology. Rolex World of Yachting video above published Sep 5, 2018: At the midpoint of the 2018 Maxi Yacht Rolex Cup the serious contenders in each class are beginning to be identified. With three days of racing left, only one thing can be taken for granted: the extraordinary racing area created by the geography of the Costa Smeralda and the Maddalena Archipelago. 41 yachts are competing at the 29th edition of the Maxi Yacht Rolex Cup, founded by the Yacht Club Costa Smeralda, hosted in cooperation with the International Maxi Association and supported by Rolex since 1985. Today, as always, the event is the pinnacle of big boat racing and the six-day regatta attracts a diverse array of Maxi monohulls all measuring over 18.29 metres. With tradition, innovation, elegance, technology and performance all represented, this vaunted gathering has compelling allure. UPDATE Sep 6, 2018: With the exception of the Super Maxi group, where the points are very close, the top players in each division are now becoming clear and the leaders of the provisional classifications are consolidating their positions. More here. The 29th edition of the Maxi Yacht Rolex Cup set sail on Monday, 2 September, with 41 yachts competing across five categories. Organized by the Yacht Club Costa Smeralda, in cooperation with the International Maxi Association and supported by Rolex since 1985, the event is the pinnacle of big boat racing. The six-day regatta attracts the full range of Maxi monohulls along with the very best sailors, both professional and Corinthian. With tradition, innovation, elegance, technology and performance all represented, this vaunted gathering has compelling allure. Rolex World of Yachting video above published Sep 3, 2018. UPDATE 4 September 2018: Unstable weather conditions, with storms around the regatta course, forced the Race Committee to abandon today's race shortly after the start. Racing is postponed until tomorrow in the 29th edition of the Maxi Yacht Rolex Cup & Rolex Maxi 72 World Championship, with the same schedule as today: windward-leeward races for the Wally Class and a coastal course for the other five divisions. Forecast for tomorrow is for a southeasterly breeze of 7 to 14 knots. Maxi Yacht Rolex Cup & Rolex Maxi 72 World Championship, 2-8 Sep 2018. Porto Cervo, Sardinia, Italy (map). Official website and results and LIVE tracking. 52SuperSeries video above published on Aug 31, 2018: the full round up of the rollercoaster week in Puerto Portals. Next up--Valencia for the big season showdown--racing starts September 18. See also Puerto Portals 52 SUPER SERIES Sailing Week 2018, LIVE Aug 21-25. INEOS TEAM UK video above published Aug 8, 2018: Jim Ratcliffe joined Ben Ainslie to give the Royal Yacht Squadron an official Cowes Week fly-by. Volvo Ocean Race video above published Aug 28, 2018: 45,000 miles, 7 teams, 1 trophy: watch all the highs and lows from sport's toughest test of a team in the official film of the 2017-18 Volvo Ocean Race.